"He keeps saying that he's fine, but he's struggling to hold back his tears. I have seen him crying in silence. He's scared but he tries to hide it from us. 3 years ago, we found out that the holes in his heart were growing. I was asked to pay Rs3,500 for the tests but I didn't have that much money, so we couldn't get the tests done. That's the biggest mistake I've made. Now he can't even walk or talk for a long time. He breathes so heavily. I feel he might leave us at any moment." - Manimaran, father. 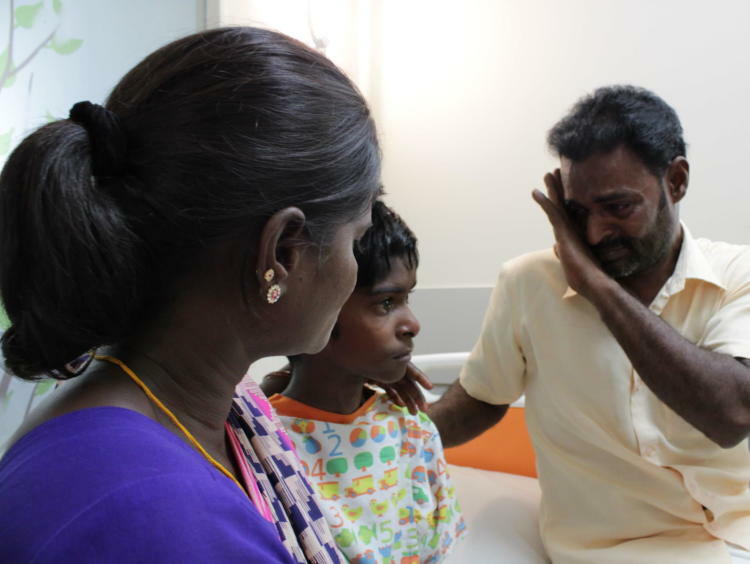 Within a few hours of Deepak's birth, a loud murmur was heard from his heart. He was struggling to breathe. He has a complex heart problem called Tetralogy of Fallot (ToF) which is a combination of four related heart defects that occur together. The four defects are holes in the heart, blockage of blood flow from the right ventricle to the artery, right ventricle pumping at high pressure and enlarged aortic valve. Adding to this, he has a deformity in the thoracic wall, a sunken appearance of the chest. It causes him severe back pain and it affects his cardiac and respiratory functions. His parents were shocked to see him in such a condition but they were told that over the years, it would heal by itself. 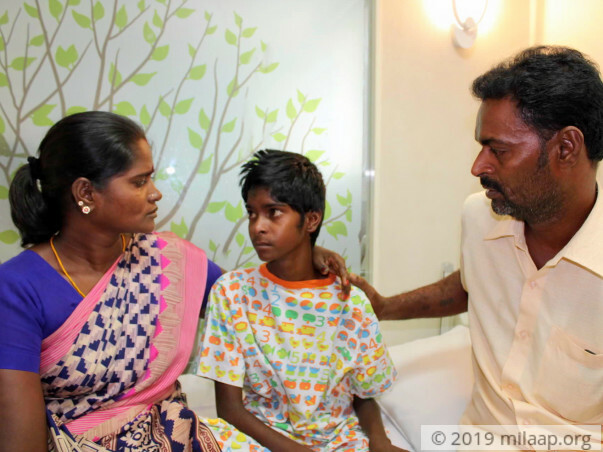 "I didn't understand anything the doctor was saying but they said as he grows up, his chest will become normal and the holes in his heart will also will disappear, but it didn't. Now doctors say he requires a surgery and he will not make it without it. I desperately wish that it's not too late." - Senthamarai, mother. His heart murmur is getting louder every day. Deepak Raj requires an urgent surgery to correct his heart defects and chest deformity. He can't walk like other kids and gets tired even if he talks and laughs. He is slipping into depression. He fears death and hardly talks to anyone now. "I'm not educated, it is my ignorance that made his condition so severe. I feel very guilty to even face him. I thought he will be angry with me for not giving him proper treatment but he is so kind. He consoles me. Last month, when we had a camp in the village, doctors were shocked to see his condition and warned us not to delay any further. They said only a surgery can save his life." Manimaran works as a daily wager in Kerala. His family lives in a village in Salem district. He visits his family once in a month and earns around Rs 300 per day. 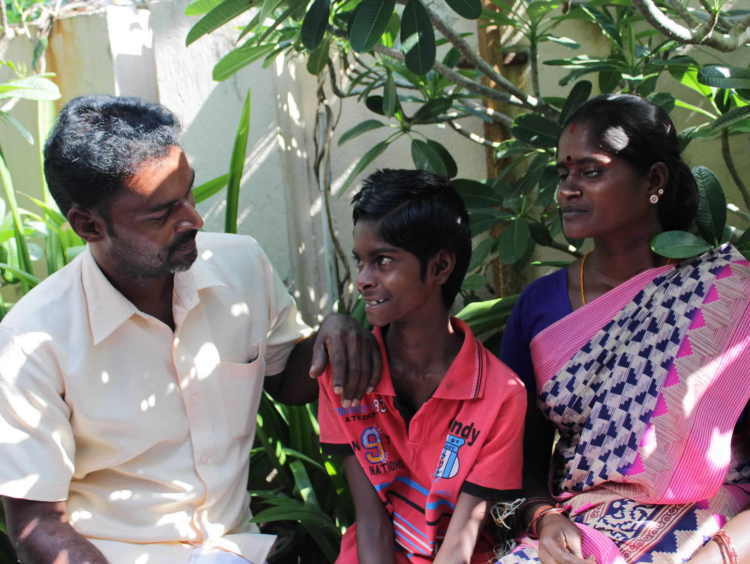 Deepak's mother, Senthamarai works as a daily wager and earns Rs 100- 150 per day. They are struggling to have even 3 square meals now. They have 3 daughters as well to take care of. The eldest daughter Divayadarshini (17), scored well in her board exams but now is forced to look out for a job to support the family. 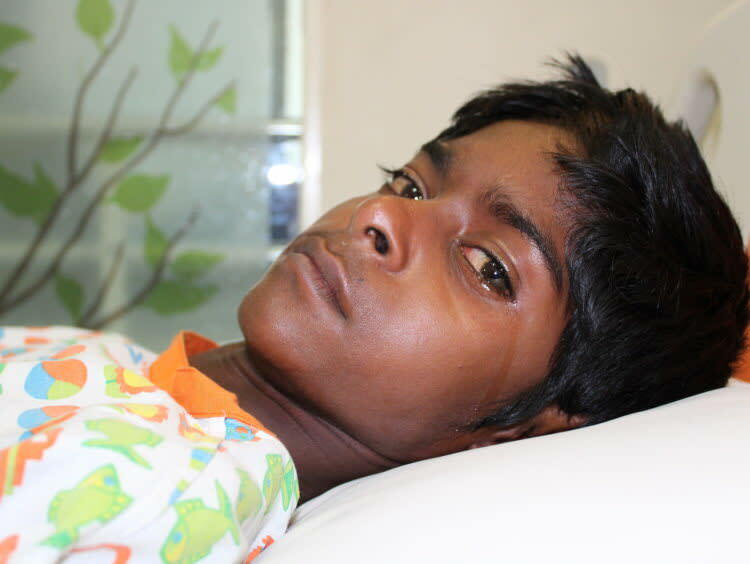 Deepak Raj needs an urgent heart surgery to survive. He has suffered a lot in silence and now is on the verge of losing his life. Surgery his only chance to survive. The only thing standing in his way is their poverty. His parents can never imagine earning so much of money in such a short period. 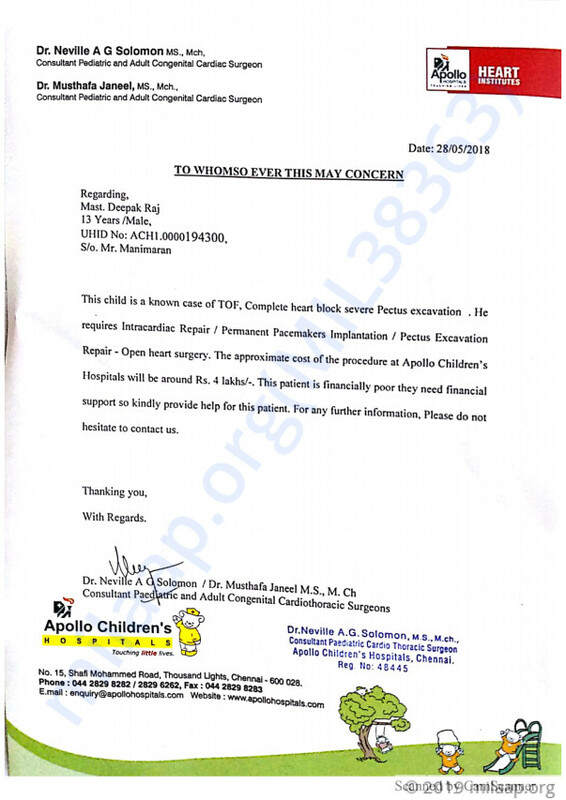 Deepak needs Rs 4 lakhs for the surgery and it's highly impossible for them to afford it. 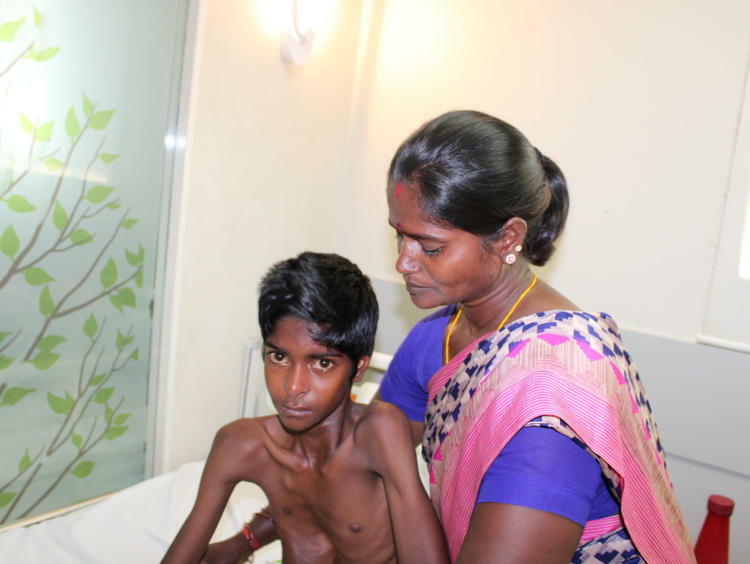 Your contribution can help these parents save their son's life. Thank you all for the enormous support towards my son. He is presently at home and doing well. The doctors have kept steel in his chest which will be removed after a year. Once the steel is removed, he will be operated for the hole in his heart. He has to visit the hospital for regular check-ups the next 3 months. Deepakraj is discharged and doing well....It was a great combined effort with pediatric orthopedics, thoracic surgeon and plastic surgeon working together. His chest deformity is corrected now and he will need a procedure after about a year or so, to correct his heart. Thank you once again for your tremendous love and support. Will keep you posted on his health. Please keep praying for his speedy recovery. Deepak is now doing better. He is yet to undergo the procedure pertaining to the equipment which is supposed to be custom made for him. He is currently at home and is on medication. We are all hoping for his speedy recovery. We shall keep you posted. Thank you again! God Bless you!! hope you recover soon!!! I pray you live a long life.